At the beginning of the discussion, it is important to understand what does actually SEO mean. SEO is an acronym for Search Engine Optimization and it is used for optimizing a website for getting search engine preference. Certain techniques are used to make search engine understand about a site and prefers the website to have the top ranking. When a search engine understands a website, it becomes easier for it to display the results when someone is trying to know about your site. SEO increases the visibility of a website and it requires strategizing, time and monitoring to get such effect which enables to drive traffic to a website. SEO is dynamic and the requirements vary continuously with the development of technological tools. Thus you need to keep abreast of the changed requirements for SEO by accurately tracking the results. There are various strategies for SEO and one of the most effective strategies is to develop useful contents around keywords. Since the algorithms used for search engines are being updated continuously, SEO strategies are also needed to be updated continuously. What is the importance of SEO for a Business? If you are looking an answer to the question what does SEO stand for in business, the following discussions can be of immense help. With the availability of the internet, it has become easier for people to look for answers to their searches online. When SEO practices are followed by a Business, it becomes easier for the search engines to understand the business and to give it a good ranking in the search engine pages. When certain keywords are typed in the search engine page, people expect to find an accurate result quickly. This is where an effective search engine optimization can help to locate such websites easily. This, in turn, increases the traffic to a website and increases the revenue for the Business easily. Also, when customers are able to locate a website and they start liking the website due to are excellent UX and UI design concepts. Thus SEO can increase customer loyalty to a website also and it becomes easier to attract and retain customers. Once such traffic starts increasing to your website, you will find people wanting to know more about the various products and services of your company. What are the key strategies and tactics for SEO? SEO like any other digital marketing has several important strategies which can play a significant role in improving the visibility and conversion rates. SEO implies increasing web traffic by acquiring new traffic and retaining them with the deployment of effective steps. There are very useful search engines available for users which can cater to the needs of the users effectively. For this, the first step is to produce quality contents along with effective keywords for helping the search engines locate your website. Useful contents developed with embedded keywords relevant to the content and relevant to the services or products of a Business will be immensely helpful. You may update the old contents, use title tags, image alt texts or Meta descriptions for doing proper optimization. It is absolutely essential for a website to have a presence on social media as it is extremely beneficial for SEO. There are several social media platforms and you need to choose the most effective platform for your Website’s presence. Also, you need to post in such platforms on regular basis to keep the visitors interested in your website. Use of social media platforms can be a great way to improve the visibility and to keep your audience engaged. Once customers visit your website, the ability to retain the customers and attract more customers will depend on the architecture of your website. How the navigational aspects of your website satisfy your customers, the aesthetics and functionalities will all be very important. Internal links which are linked with the other pages of the website will be very helpful for visitors. A smooth and seamless transition to different pages can be effected in such a way and navigation will be a pleasurable affair. Moreover, the bounce rate will be reduced and the conversion rate will be higher in such a case. When more external domains link your website, the search engines give more credibility and more visibility to your website occurs. This type of backlinks can be created when some external site effectively links your website. Search Engines considers this as useful when other external sites consider your Website as valuable. This way the search engine rankings for a website can be very good and very effective also. There are other means to improve the search engine rankings, but the basics concept remains to find out the right way to improve visibility. You have to utilize several SEO tools while implementing effective SEO strategies and may employ and may seek guidance from expert professionals. Originally published at Lokesh Aryan. 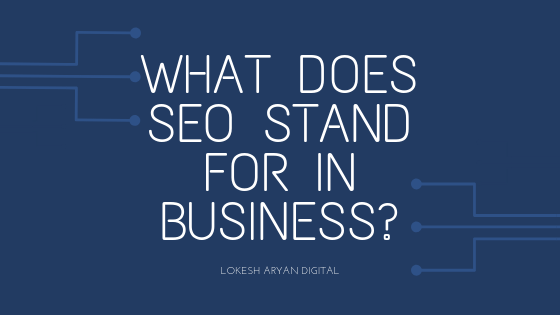 Welcome to Lokesh Aryan Digital - a platform to discuss and learn more about Digital Marketing. Founded by Lokesh Aryan, the platform aims to guide you a give you tips on how to easily use the tools available for SEO and informative content about digital marketing!